What is in this box you ask? 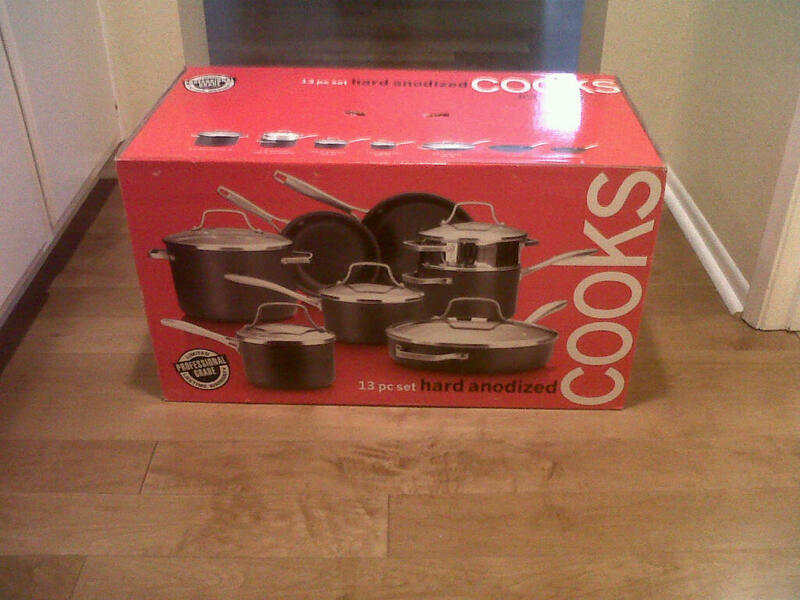 Well I will sadly say that tucked into that “JC Penney Cooks 13 piece pots and pans” box is my beautiful WEDDING DRESS! It kills me that it is stuffed (yes, trust me it is stuffed) into that box, pushed in the back of a closet, screaming for the attention that it so deserves! After my wedding and honeymoon, I came home to my amazing dress hung up, covered, and ready to be taken to the cleaners. However, like so many other brides, I eventually tucked it into the nicest box I could find after my husband got tired of it hanging in our guest bathroom doorway. We were moving, and rather than risk it getting dirty or torn, I packed it. I packed it literally telling my husband as I was taping up the box, that as soon as we moved it would go to the cleaners to be preserved. “I want to keep it forever” I told him. Well ladies I’m just not so sure anymore. The part of the story that I left out is that I had 2 dresses on my big day. That’s right, I was ridiculous and bought a “ceremony” dress and a “party” dress. Both equally as amazing, both I fell in love with. The deal I made with my husband however, was that if I bought a 2nd dress, I’d sell it right after the wedding to try to re-coop some of the cost. I promised I would, and I kept my end of the bargain. Not even 3 weeks after the wedding I was packing up my 2nd dress, sending it to Idaho for a new bride to enjoy. Yes, I was sad to see it go, but I was happy that I had found a great buyer. I sent it to Idaho with a smile on my face. Hey, I still had my “ceremony” dress after all right? I’d keep that one “forever”. Now, almost 8 months after my wedding, I can’t help but wonder if I should sell my first dress. Yes, I love it, and yes, I wore it when I married the man of my dreams, but what am I going to do with it now? How much longer is she going to live in the JC Penney box? Will my daughter even want to try on my dress in 20 years when she is ready to walk down the aisle? Who knows, maybe strapless dresses will be so “2011”! Maybe even in its perfect wedding dress box, fresh from the cleaners, I’ll struggle to find a home for it. I guess what I struggle with is the feeling I had when I sold the other dress. I honestly felt so good about it. Not just because of the money, but because I helped another woman have her dream dress. The bride I sold to had been looking for months for a Sottero and Midgley “Billie” dress, but could not find one in her price range, or even close to it. She couldn’t even find the dress in Idaho to try on! She tried to have someone custom make the dress for her, but after spending hundreds of dollars, the dress was not even close to the original. She saw my ad on www.oncewed.com and emailed me 3 times in one day! “OMG, please tell me you still have this dress! I am praying you still have this dress!” she wrote. I had the dress, and I was so happy to sell it to her. After she received it, I got one of the nicest emails I’ve ever received. She thanked me from the bottom of her heart for giving her a great deal. She was thrilled the dress was practically in perfect condition, and it fit her perfectly. It warmed my heart. She attached a photo of herself wearing the dress, it was perfect. It was mine, but I had my moment in it, and now it is hers. I’m just wondering if other brides are finding themselves in this same predicament? I bet you are! On one side I truly want to keep my dress forever, but on the other side, I see how great it could be to help another bride find her dream dress at a fraction of the cost. It felt so good the 1st time I sold, why not do it again? If you are looking for a dress, and are on a budget, consider looking at used dresses. Looking for a 2nd dress like I did? This is a great option to save some cash! Hey, in my case, I was selling a dress that I had only worn for a few hours! It was practically brand new! You can really find something great, at a great price, if you do it the right way. The best websites to post used dresses or buy used dresses are www.oncewed.com , www.weddingbee.com, and www.recycledbride.com . These three websites provide you with a ton of information. BE SMART THOUGH LADIES! Ask a TON of questions, ask for a TON of photos, and talk to the seller on the phone if you can. Buying anything online is scary, so you want to be a bit guarded. The right seller will completely communicate with you and be willing to provide you with ANYTHING you are asking. If she is being honest, she has nothing to hide. If you are local, or even close to the seller, go and see the dress in person! Again, if she’s trying to sell it, she’ll have no problem. Any past bride will understand what a big decision this is for you. Next Post that costs how much? ?